Welp, I've decided to make a TT64 tutorial just for you guys! I know, there's already another one, but the images are outdated so I bet you're sitting there like "...?" 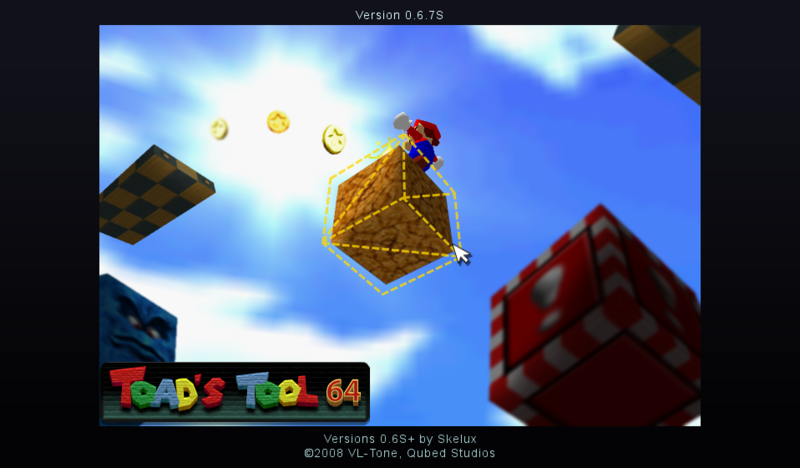 Now get the SM64 Vanilla (base) ROM. It can be found here in the "Rom hacks" section. Where it says "Open ROM", click on the button, and open the original SM64 ROM. It should go through a few prompts and command windows. Just click ok whenever a window pops up. Once you get the message at the bottom of the window with red text, you should be all set! Close out the SM64 Editor and open TT64. This picture should come up. Click on it or else nothing will happen. Then select your ROM. You should see that you're outside the castle. Let me explain some things that will come in handy. On the top-left side of the screen, notice "3D Objects" and "Macro 3D Objects". Some objects are in 3D objects only (like flames) and vice versa. Keep in mind that the list changes per level. There's a list of red text under that. That's the list of objects in the level. This list is a list that changes the most. Under that, there's a list of black text. That's the object list. When you select and object, you can click something from this list to change it. At the bottom of your screen, there's a bar with a whole ton of things. Locate ROM Address. Keep in mind that you won't really need to use this. But above it, there's "Basic" and "Expert". Clicking "Expert" will make 2 more things pop up in the bar. This is only needed when editing the 3D Objects as they're locked when editing Macro 3D Objects. Click "Basic" to change it back. Above ROM Adress there's Drop to ground. You can use this to drop something to the ground below/above. To organize things, click "ABC" on both the list of red text (0x24 3D Objects) and the list of black text (Set Object Combo). Let's start with turning a Castle Flag into a coin. Click "Castle Flag" in the 3D Objects list. On the bottom-right of your screen, locate Orbit and click it. Now the screen locks onto the item you select. Now scroll through the Object Combo. Once you find "coin", click on it. The flag should now be a coin. On the bar near the bottom of the screen, there's a move arrow and a box next to it. Click and drag to move things. Next to that is a vertical bar with blue lines. Click and drag that to move things vertically. Great! Now you turned it into a coin and moved it! Select other objects on screen by right-clicking. Left-click and drag to pan the camera around. Now that you know this stuff, mess around a little bit with what you know. Once you feel ready to test it, click Launch ROM at the top of the screen. Project64 or Mupen (depending on which one you use to open ROMs) should pop up. Now you're free to test it. "But wait a second, I wanna edit some other levels, too!" To do this, go back to TT64 and click on the arrow next to "Course: Castle Grounds". There's a list of levels. Select any level you want. Now test your skills there as well! That's all for this tutorial! I hope this helped you understand how to use TT64. If you have any question, drop some down below. (05-26-2017, 10:49 AM)Owen Jones Wrote: Good tutorial! The SM64 Editor Tool link no longer exists as stated. http://origami64.net/showthread.php?tid=39 Otherwise good tutorial!